When you’re a company the size of Microsoft, you have a lot of options for your events. For the closing party of its MSN Strategic Account Summit, the software giant decided against renting out a bar or club. Instead, it rented Safeco Field, home of the Seattle Mariners. Microsoft even trotted out ex-Mariner Jay Buhner to give tips to tipsy clients trying their hand at batting practice. Jay must have loved that gig. The Mariners slightly terrifying mascot, Mariner Moose, even made an appearance. 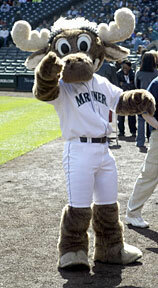 In case you’re interested, Mariner Moose is apparently available for weddings and Bat Mitzvahs.